NO RESERVE. - parking aid (rear). - electric seats. - electric one touch windows (front and rear). - seats electric(driver/passenger). - adjustable steering position. - central door locking. Looking for a quick sale as I now have three cars on my drive! Drives very well, for sale as spares or repairs due to airbag light on, brake vibration at high speeds (probable front discs) & short mot 1/5/19. Everything works, tyres including spare all have plenty of life in them, 5 full size alloys in reasonable condition. For sale I have my 1991 BMW 316i E30. Only managed to fit in 600 miles last year and around 1500 miles per year for the 4 years prior. The bodywork is a little tatty and the paint is faded in quite a few places. 2002 BMW E39 540i Sport Auto 4.4L V8 – 14200, FSH, Genuine 17" SPORT Alloys. 2002 BMW E39 540i Sport Auto 4.4L V8 – 14200, FSH, Genuine 17" SPORT Alloys. Bodywork in Good condition overall. Minor onset of rust and small crack in rear bumper as visible in pictures. Low mileage e39 the best shape and model this car has good history.Mot 02/2020. Recently had a full service, new braking pipes and braking lichid also new rear parking sensors.17" wheels with good tyres. For sale BMW 520i with 2.2 litre petrol engine in very good condition - few minor scratches related to age but nothing major. Suspenion without any noise, interior in very good condition. Two new rear tyres, front tyres in vgc. Best colour ! So as these got developed more and more the car practically was forgotten about. Brake lights are constantly on but if you lift the pedal they will go out. Since being moved and parked again typically the car will crank and start for a second then cut out unless fed fuel/brake cleaner threw the intake, so suspect possibly pump or fuel filter. I had been using the car daily for commuting up until 6 weeks ago and it runs and drives fine. MOT runs until November and had front wishbones and anti-roll rods replaced for the MOT. Tyres are also all very good plenty of tread on them. BMW 5 Series 520i 2002 Model. Located in Liverpool. Call for viewing 07903050615 or for more information. Here we have my BMW 523I Auto 2.5 170bhp model bullet proof engines. FK coilovers all round. M-sport steering wheel. Airbag light is on dash from when I changed the steering wheel too m sport one. Car has mot until jan 2019. Here for sale is my BMW E39 525i. 4 door saloon. Bmw Premium Speaker system with radio/cassette and 6 cd changer in the boot. 2003 model so is ULEZ EXEMPT. Full electric windows and mirrors. it is a 16 year old car so does have a few marks here and there, nothing major. 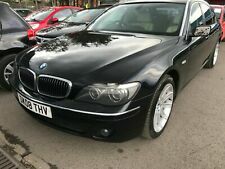 I have for sale 2004 BMW 735i SE Auto 4 door saloon. I changed oil in it and put new battery. FOR SALE IS THIS VERY WELL MAINTAINED 525i PETROL AUTOMATIC LONG MOT FULL BMW SERVICE HISTORY VERY CLEAN CONDITION IN AND OUT DRIVES VERY WELL WITH A SMOOTH ENGINE AND GEARBOX NO LIKING OIL. Cash on collection.